I fell in love with Amsterdam several years ago, and the love affair is still ongoing. The Dutch treat their capital city with such respect, maintaining a beautiful balance between modernity and tradition. To paraphrase the Lotto, the first thing I'd do upon winning would be to buy a canalside apartment in Amsterdam. As hotel rooms appeared to be a premium price when booking our recent trip, I expanded my search, and we found ourselves a lovely apartment on Weteringschans via Airbnb. Why on earth would I pay over €600 for two nights accommodation in any of our usual spots when a charming apartment would cost than half? As this was our first Airbnb experience, I wasn't too sure what to expect. However, our host was perfect, quickly getting us settled in and then leaving us to our own devices. Our choice of location turned out to be a winner, with light wooden flooring, white walls and lovely views over Stadhouderskade and the famous Rijksmuseum. Over the course of just two days, I fell in love with sitting on the leather sofa, watching the city fade into twilight. 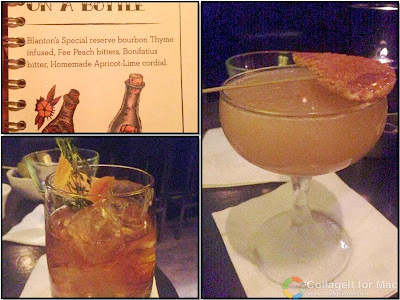 During our earlier visit in February 2013, we had explored some of Amsterdam's cocktail scene, and I was determined to continue. Door 74 (Reguliersdwarsstraat) is a private bar, with reservations only possible on the same day. I left a voicemail at approximately 11am and waited. Not knowing if I had a table or not didn't sit comfortably with me, but eventually a text message arrived at 4pm confirming our reservation. Door 74 is dimly lit, with a group of mixologists working behind a very bottle-laden bar. Large bowls of olives and snacks were delivered to the table and water glasses were kept continuously topped up throughout. The current menu is tattoo-themed with prices on the slightly high side. My first cocktail, a Dia de los Waffelos, featured a smoky and sweet mix of mezcal, yellow Chartreuse, lime, stroopwafel, speculaas and black walnut bitter. The uniqueness continued with the Message on a Bottle (thyme-infused Blanton's Special Reserve bourbon, Fee peach bitters, Bonifatius bitters and a homemade apricot-lime cordial) which came served in a small glass bottle ready for pouring. After Door 74, we decided to hop on the tram and head out of town towards the De Pijp district. I had heard rumours of a secret cocktail bar and restaurant behind The Butcher burger bar on the famous Albert Cuypstraat. Unfortunately, I couldn't secure a reservation, but we decided to visit for burgers anyway. The minute I saw the grill chef heavily salt a patty with rock salt and place it on a charcoal grill, I knew we were in business. My Daddy burger was the veritable father, featuring a 250g patty topped with Edam cheese and grilled bacon (€10.95) with a side of perfect fries (€2.50). His smaller truffleburger was wonderfully pungent from a truffle glaze atop the usual salad accoutrements (€9.45). The next day we got up late and caught a tram to Dam Square so we could visit de Bijenkorf, Amsterdam's famous department store. It was the final day of a 3 day sale and the store was hopping with bargain seekers. We joined the untypically chaotic Dutch shoppers with gusto, finding ourselves some excellent deals. But however good the deals were, one of the best things about de Bijenkorf is their excellent self-service cafeteria on the top floor. 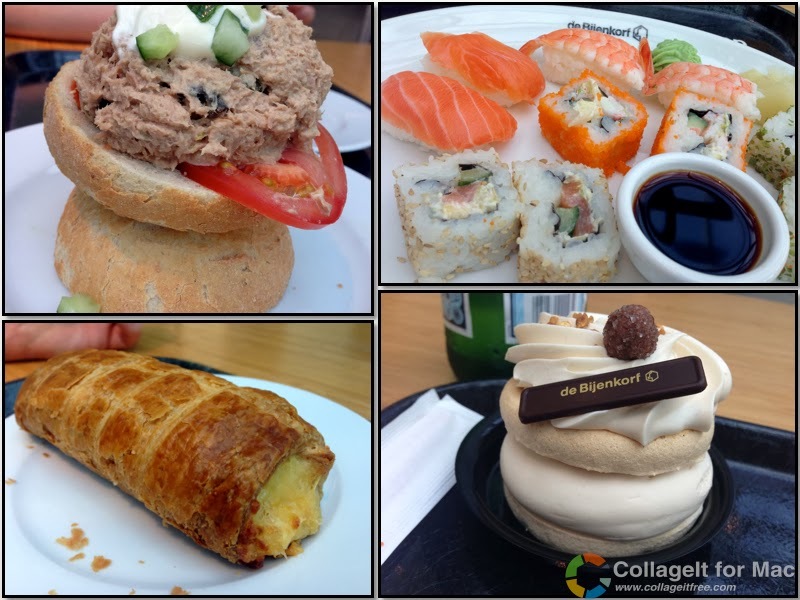 There's a wide range of fresh foods on offer, stretching from burgers and salmon which are grilled while you wait, glasses of fresh smoothies embedded in ice, a wok station, traditional Dutch sandwiches and patisserie. Oh, and did I mention the pizza and sushi? In short, there's something for everyone. 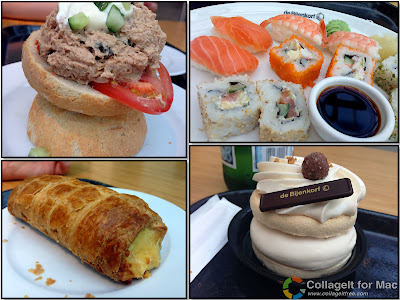 On our visit, he made straight for the tuna sandwich and a flaky kaasbroodje (cheese roll). I filled a plate with sushi, and chose a nutty meringue dessert as a sweet treat. Another favourite casual dining spot when in Amsterdam involves Burger Bar, with three locations throughout central Amsterdam. The basic burger option features Irish beef, with Angus and wagyu beef available at extra cost. The special featured topping changes monthly with Old Amsterdam cheese available on this visit, while foie gras was available on an earlier trip. The fries are really superb, and I always choose a pot of spicy samurai sauce for dipping. 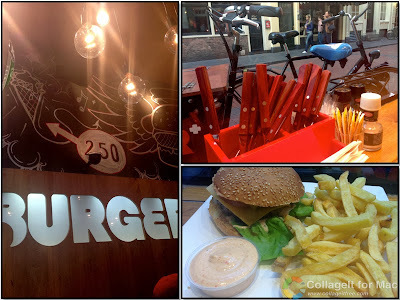 For a quick, but high quality meal, Burger Bar comes recommended. Another long-term favourite is Cafe de Klos (close to Leidseplein). In a city where spare ribs are a borderline obsession, the ribs at de Klos surely reign supreme. de Klos is full of the traditional Dutch brown bar atmosphere with gilded crests and Old Master style paintings on the wall, but in reality it's the grill at the end of the room which is the real heart of the bar. It's always busy, but you will understand why when the scarred and battered wooden platter lands in front of you. 4 small slabs of ribs, a side salad, sliced baguette and some sauces will cost €16, with plenty of toothpicks to help remove the inevitable meat pieces. On our final morning in Amsterdam, we walked the short distance to the Rijksmuseum. This grand old building had been swathed in sheeting during my time in Amsterdam, but now the 8 year renovation project is complete and the results are magnificent. An arched and vaulted tunnel allows you to walk through the building, opening out onto Museumplein. It's a little surreal to have bicycles whizzing past as you walk through, with large windows granting views into the supersleek museum. We didn't have time to explore the galleries, but we did stop for a quick morning coffee. I was delighted to see that the patisserie in the cafe is supplied by the delicious and wonderful Holtkamp patisserie, which was located just around the corner from my apartment. So in order to finish our Amsterdam trip, we enjoyed two slices of cheesecake, topped with a sharp blackcurrant layer. And then it was time for home. But first there was shopping at Schiphol Airport where I filled up on the delectable stroopwafel for my friends and colleagues and a block of mature Repyenaer cheese for myself. Then it was time to say "vaarwel" to Amsterdam and take my weary feet home.